Life wouldn’t be the same for us if we didn’t have power. The lights and appliances in our homes, cars, buses, and trains, and certainly our personal devices, all run on power. Let’s explore where that power comes from! It's time to fill up the tank and recharge your batteries. Can You Collect Sunlight? What Is Gasoline Made of? These Wonders about energy sources will keep you going! Do you need electricity to cook a meal? The answer might surprise you! 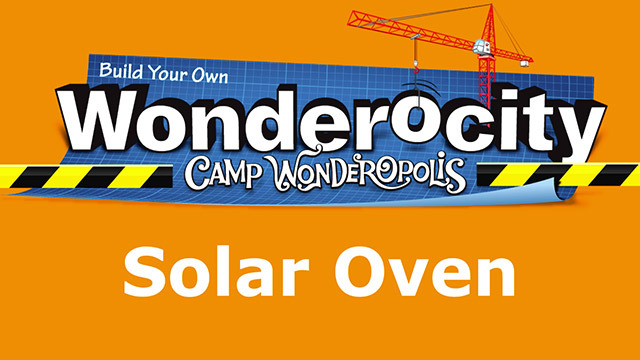 Harness the power of the sun when you build your own solar oven! Measure an inch from each edge of the pizza box and mark with a pencil. Draw a square on the pizza box using those measurements. Cut three sides of the drawn square to create a flap. Wrap the inner side of the flap with aluminum foil and secure it in place by taping it to the back of the flap. Open the box and secure two layers of plastic wrap over the opening you just cut in order to create an airtight window. Use enough plastic wrap so that it can be secured tightly to the pizza box lid with tape. Tape the plastic wrap to the box. Line the inner bottom of the pizza box (where the pizza would lay) with black construction paper and secure it with tape. Roll up four tubes of newspaper (each 2-3 inches thick) and tape each one so that they do not unroll. Place each tube inside the pizza box along one side (top, bottom, and two sides) so that they serve as insulation. Secure each one to a side of the pizza box with tape. Find a sunny place outside to position your solar oven. The best time to cook your food is when the sun is directly overhead, between 11am and 3pm. Place your food item on a plate inside your solar oven and close the lid. Lift the flap and angle it so that it receives a lot of sunlight that it can reflect onto the plastic-wrapped window. Prop it up using a ruler, wooden spoon, or stick. Place a thermometer inside the oven to check the temperature later. Most meats need to reach an internal temperature between 145-165º F (about 63-74º C) in order to be safe to eat. When the food is cooked sufficiently, use oven mitts or potholders to remove it. How long did it take for your food to cook? Can you think of ways to make the solar oven cook food better or faster? Solar ovens work by focusing sunlight onto a small area which can become very hot when the sun's light is converted to heat energy. Black absorbs light, which converts to heat. The solar oven's aluminum reflective panel focuses the sunlight in a small area to concentrate the sun's heat energy. The box holding the food has insulated walls (the newspaper) and a clear lid that allows concentrated sunlight in but keeps the heat from escaping. Test out different materials for your solar oven, like a shoebox or even an umbrella. Can you find a better container than a pizza delivery box? These reading lists were provided by Leonard Reed Elementary School in Cedar Park, Texas.